Long known for bold designs and an x-centric focus, 2015-16 SPx Hockey is back for another year. Featuring a bright, new rookie design that is anything but subtle, boxes include one autograph and two additional hits. Dipping slightly to ten packs and dropping one hit per box, the rest of the SPx set remains largely intact. The moderate 60-card base set is enhanced with Rookie High Series Foils that are short prints and average 1:4 packs. Multiple rookie options exist, including Acetate Jersey Rookies (#/349) and Acetate Auto Rookies (#/299). Likely to command the most interest are the Acetate Auto Rookie Jerseys that are numbered to either 499 or 349. 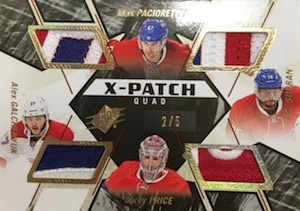 Featuring top rookies names like Connor McDavid and Artemi Panarin, the loud cards also available in Red (#/50) and Green (#/10) parallels. 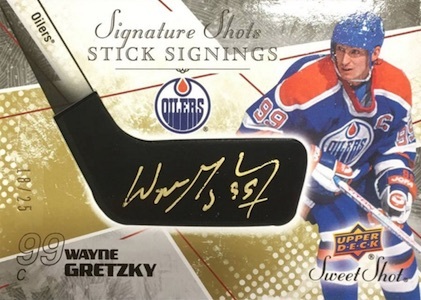 Other top options in 2015-16 SPx Hockey include the unique Sweet Shot Signature Shots Stick Signings (#/25). 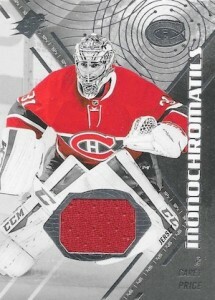 Monochromatics is a new addition that includes a relic piece and a black-and-white image with only the player's jersey shown in color. Looking back, Retro Rookie Autographed Jersey Cards (#/225 or 125) celebrates the 2005-06 set. 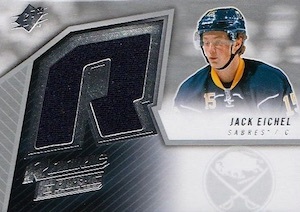 X-Jersey Relics comes in both Dual (1:80) and Quad (1:160) versions and also offers a Patch parallels. 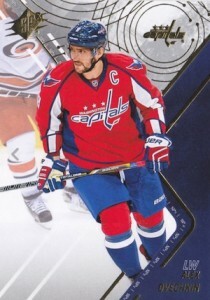 Inserts round out the release with Shift Change (1:5 packs), Stick Wizards (1:5 packs) and Name on Front (1:23 packs). Each come as signed parallels. 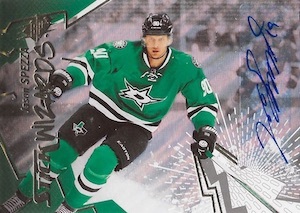 Covering those new players that missed the first run of 2015-16 Trilogy, the product also features a Trilogy Update with base Rookies (#/799) and Autographs (#399 or 99). 130 cards. Shop for base sets on eBay. 8 cards. Serial numbered #/299. Overall odds - 1:320 packs. Specific group odds noted below. Overall odds - 1:16 packs. Specific group odds noted below. 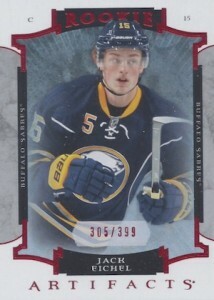 PARALLEL CARDS (*Eichel card not signed. *): Autograph Jersey #/399 or 299, Autograph Patch #/10. All subjects not included in signed parallel. View the spreadsheet for specific print runs. 33 cards. Specific group odds noted below. 9 cards. Specific group odds noted below. 5 cards. Serial numbered #/399. All subjects not included in each parallel. View the spreadsheet for specific print runs. Can’t wait for this year SPX, I almost have ALL the 2014-15 spx (for real). I think im gonna buy a case! Upper Deck will require a receipt and the UPC Code. They will also need the damaged card or cards. Take photos and copies of everything. Less cards less hits same price. Upper Deck at its best again…. Was hoping a few of the Leafs rookies (Nylander in particular) would be in as redemptions in time. if have 0 on rating i will put!! !dont buy this stuff you very sad after!! !all cards are bolsh**t rookie jersey are to small jersey and nothing in box for that price,for $ for 4 cards and 10 packs !! 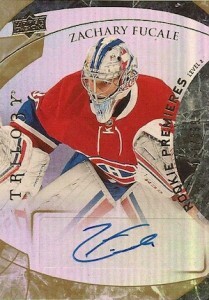 !do like me stop buying upper deck cards !! !20 year buy some stuff of ud and this year i never see something like that!!!!! For me this is a 2-star release. I can actually think of quite a few ways it could have been upgraded to a 4-star release. Although not terribly expensive, there is not even remotely close to the cost of a box in value in probably 19 out of every 20 boxes…like not even in the same ballpark. If this was exactly as is…but only about $75 CDN per box…4 stars. How did they go to 3 “hits” a box for this price? not even an auto is guaranteed per box. Shameful. Oh, and most of the top rookie signatures are redemptions of course. This is your exclusive provider of NHL licensed Hockey for the foreseeable future everyone. Why there isn’t a bigger outcry like you hear with Panini and their exclusive?? maybe Hockey just isn’t a big enough market. This product is a complete failure, nothing unique, creative or innovative. Same as all, either you get Mcdavid or get bent. have fun next year! 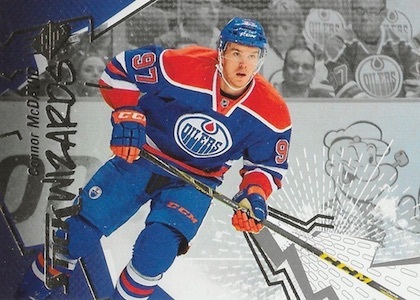 I’ve been collecting hockey cards since I was a kid I gotta admit that the 2015-16 hockey cards that are coming out are ruining the fun for me. Upper Deck provided more value per box when Panini was there to compete with them. Now they do what they want and reduce the number of packs and hits per box on almost all their products but still sell well because of a phenom that won’t be there next year. I have not bought anything this year and am boycotting 2015-16 Upper Deck products. 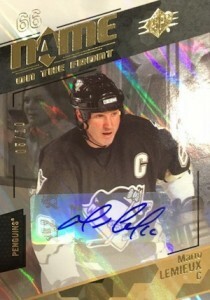 Best year was 2005-06 and I’m glad I bought a lot of products from Crosby’s rookie year and 10 years later another phenom takes the collector’s money but wait till next year UD it won’t be as rosy. Shame on the NHLPA for giving an exclusive to UD. Only breakers are making money not collectors unfortunately. SPx was never my favourite and this years version is even worse. Design a bit better than last year maybe but not too many other redeeming factors. Less/no chance of hitting interesting memorabilia inserts. 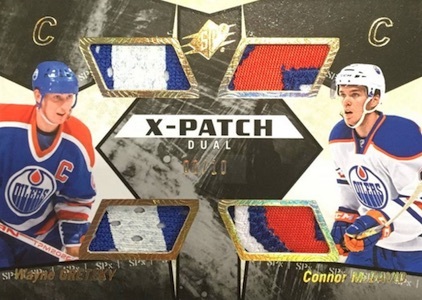 Sticker event worn jersey autos not very appealing to anyone, and even McDavid hits in this product won’t have much appeal after a while. Wow, how much more junk can UD put out!! This stuff is absolute garbage, not even close for value wise in a box, let alone a case !! Although I did quite bad, I cannot rate this product low. That’s was just my bad luck. I thought this year’s Spx, like most of UD’s offerings so far, was garbage. Most of the jersey/patch cards are manufactured or event-used, not game used. I had some quality issues, where 2 boxes didn’t have the signed rookie memorabilia per box as promised. Instead they just had 2 hits each. Upper Deck is obviously cashing out this year. How Beckett is giving these products 3 and 4 stars for value is beyond me. In fairness to them I will probably still buy more this year because of the strong RC crop, but I won’t be back next year. The value of this product is surprizing to me. I pulled a 2015 SP Authentic Connor Mcdavid future watch patch auto #’ to 100 and it booked at $2500 and it sold for $1200. I then pulled a Connor Mcdavid stick signings auto #’d to 25 and it books at $400? How is that possible? SPX has a smaller print run, the autos are harder to get, and the boxes are more expensive per pack average yet the Mcdavid is valued LESS than SPA? Makes no sense to me. Dont like this product. 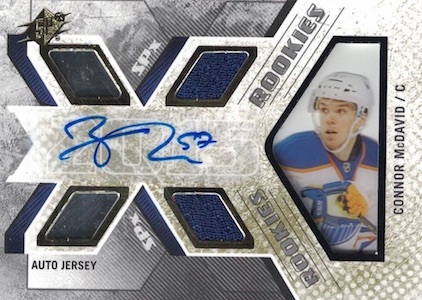 2015 16 UPPER DECK SPX HOCKEY HOBBY BOX - McDAVID AUTO ? - 3 HITS PER BOX!